America has a long and proud history of being at the forefront of transportation technology. Examples include the Wright Brothers’ historic first flight, Henry Ford’s Model T, the Transcontinental Railroad, the Panama Canal, and, of course, the first lunar landing. The movement of people and commerce has been integral to our country’s development and history from the beginning. A diverse transportation system utilizing land, sea and air evolved, connecting all points of the compass, shipping supply to meet demand, and connecting farms to urban tables and Mother Earth to outer space. Thankfully, the rich, colorful history of transportation in America has been preserved at a number of fine museums across the country. Read on to learn about eight of them that are well worth a visit. California State Railroad Museum (CSRM) is the nation’s largest train museum, and it serves as a world-class tribute to the role of the "iron horse" in connecting California to the rest of the country. Prime among its exhibits, displayed both indoors and outdoors, are 19 meticulously restored steam locomotives, plus dozens of vintage passenger and freight cars, some dating to the 1860s, that help visitors understand how railroads shaped the West. A current exhibit features a high-speed train simulator that allows guests to experience the sensation of piloting a modern high-speed train. A variety of excursion train rides are available to the public year-round. www.csrmf.org, 916-323-9280. Fun and informative for kids and adults alike, this waterfront museum is the focal point on San Diego’s historic Embarcadero promenade. Comprised of a number of painstakingly restored historic ships, it enjoys a worldwide reputation for excellence in restoring, maintaining and operating historic vessels. Among its collection is the world’s oldest active sailing vessel, the 1863 Star of India and the 1898 Berkeley, the first propeller-driven steam ferry on the West Coast. Both are State and National Historic Landmarks. The Maritime Museum of San Diego hosts a number of special exhibits, events and sailings aimed at engaging visitors through bringing the histories of its ship to life. www.sdmaritime.org, 619-234-9153. This museum is an absolute must-see for auto enthusiasts. The 100,000-square-foot building in Reno houses one of the largest and finest collections of antique automobiles to be found anywhere. It displays a significant portion of the late gaming pioneer Bill Harrah’s collection of 1,400 vehicles. Cars are grouped by age in street settings appropriate to their time. Real-life backdrops such as Burma Shave signs and vintage gas stations add to the atmosphere. Classic cars make up most of the collection but there are rare prototypes and unusual one-of-a-kinds, along with cars either featured in films or owned by celebrities — such as John Wayne’s Corvette and a Caddy once owned by Elvis Presley. Reasonable entry fees are a plus. www.automuseum.org, 775-333-9300. Today’s kids are geared to video games, but those who visit Iowa’s Trainland U.S.A. quickly become converts to old-fashioned toy trains. "Many youngsters come in wide-eyed and can be halfway down the aisle before their parents get in the door," says Judy Atwood, who has run the model train museum with her husband Red for the past 36 years. Designed to depict the development of railroads across the United States, it features 2,600 square feet of display space, coursed by nearly a mile of HO gauge track. 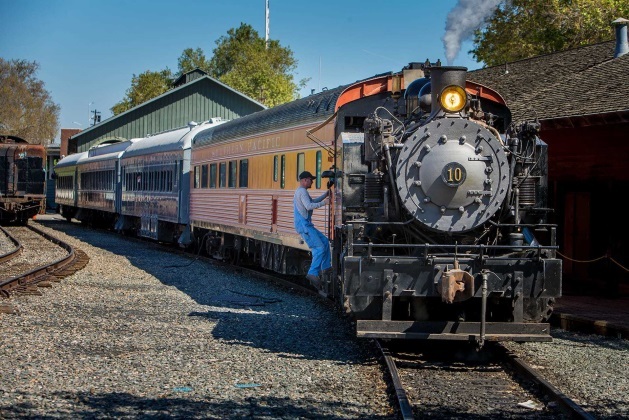 At any given time, up to 25 vintage locomotives, including turn-of-the-century steam engines hauling freight and 1950s diesels pulling streamliners, can be seen in action at this family-friendly attraction. www.trainlandusa.com, 515-674-3813. Wright-Patterson Air Force Base is home to this amazing complex that serves as the official museum of the United States Air Force. It also ranks as the oldest and largest military aviation museum in the world. With more than 360 aircraft and missiles on display, it’s a major tourist attraction, drawing more than a million visitors a year. The museum’s collection includes many rare aircraft of historical and/or technological importance. Among them is the only surviving North American XB-70 Valkyrie bomber, one of four remaining Convair B-36 Peacemakers and the Boeing B-29 Superfortress that dropped the atomic bomb on Nagasaki during the last days of World War II. At home here, too, are several presidential aircraft, including those used by Franklin D. Roosevelt, Harry Truman, Dwight D. Eisenhower, John F. Kennedy and Lyndon B. Johnson. www.nationalmuseum.af.mil, 937-25-3286. Originally formed in 1963 as a partnership of the Norfolk & Western Railway and the city of Roanoke, this excellent museum houses more than 2,500 objects showcasing Virginia’s rich history of rail, air and road transportation. While all modes of transportation are represented, the museum focuses on Roanoke’s railroad heritage. Its collection includes more than 50 pieces of rolling stock — locomotives and other rail cars — including the largest array of diesel locomotives in the South. The star of the show is No. 611 — an impressive Class J passenger steam locomotive from the 1940s — that was capable of pulling 15 cars at speeds up to 110 mph. Road-related exhibits present a history of transportation ranging from horse-drawn vehicles to cars, truck and buses from every decade of the 20th century. www.vmt.org, 540-342-5670. Since opening on the National Mall in 1976, the Smithsonian’s National Air and Space Museum has become the hub of all things flight. The museum (along with its second location, the Udvar-Hazy Center in Chantilly, Virginia) contains the most significant collection of aviation and space artifacts (more than 60,000 objects) in the world. It draws almost 6 million visitors annually. A massive renovation of the museum’s exhibits will be taking place during the next several years, but the museum will remain open throughout the project, with phased closings/openings of galleries. Museum favorites will remain on display during the renovation including the 1903 Wright Flyer, Charles Lindbergh’s Spirit of St. Louis, the Bell X-1, North American X-15 and the Apollo 11 Command Module Columbia. In addition to its exhibits, the museum features an IMAX theater and a planetarium. www.airandspace.si.edu, 202-633-2214. Although it’s not among the nation’s best-known automobile museums, this Florida repository of vehicles both antique and unique is a dandy. Employing a solar-powered two-story, 100,000-square-foot showroom, it currently displays more than 160 wildly diverse vehicles and a vast collection of Americana. It’s an eclectic hoard that ranges from typewriters to telephones and cash registers to the country’s largest collection of Case knives. Special, too, is a stunning collection of Steinway pianos — said by the company to be the "finest private collection of Steinways in the world." It’s the exotic autos, however, that draw the crowds. They range from an 1894 Duryea, one of the first autos manufactured in the U.S., to a fleet of modern muscle cars. The museum also displays a trio of original Batmobiles, including the cars seen in the movies "Batman Returns" and "Batman Forever." www.tacm.com, 850-942-0137.